When you want to install latest version of MySql server in Linux (Ubuntu), like other applications, the easiest way is installing it from APT repository. 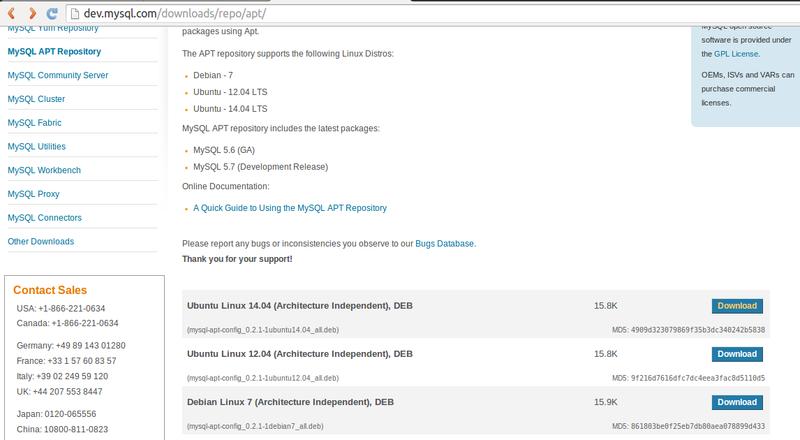 But, default APT repository sources in Ubuntu still doesn't include latest version of MySql. I just finished installation of Ubuntu 14.04, but when I wanted to install MySql, it still installed MySql 5.5. Latest stable version of Mysql server is 5.6 (in 2014). So, this is how you can install MySql server from APT repository. 5. choose latest MySql version you want to install. If you already have installed older version of MySql server, you can see my older post how to upgrade MySql 5.5 to 5.6. If you already have earlier version of MySql server and you installed new version from repository, you probably need to run following command and restart your mysql service.